The government’s ambitious mission to control diabetes has made a reluctant start. Worse, it suffers from lack of planning. The project was launched as part of the National Programme for Prevention and Control of Cancer, Diabetes, Cardiovascular Diseases and Stroke (NPCDCS). The first phase of the diabetes control project started in July last year and is scheduled to be over by April 2012. It has three goals—awareness, screening and treatment. It took the government a full year to launch just the screening campaign. Union Minister of Health and Family Welfare Ghulam Nabi Azad inaugurated the campaign to screen diabetics on June 30. 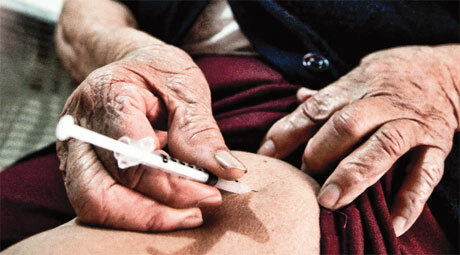 By 2011 end, diabetics in 30 districts of 21 states are to be identified and provided free medicines. Another 70 districts are to be covered by 2012. Considering the government’s go-slow attitude, it is unlikely to meet the deadline. It has invested Rs 1,250 crore on NPCDCS. Of this, Rs 500 crore has been allocated for diabetes and cardiovascular diseases. The ministry purchased 6,000 glucometers and 12 million strips at the cost of Rs 10.5 crore from US firm Abbott. Rest of the amount has been given to the states, says Bachani who spearheads the initiative. He is deputy director general, non-communicable diseases at the health ministry. But funds have not reached the districts yet. Venkyat Kshirsagar, supervisor of district hospital at Washim, Maharashtra, confirms this. Districts in Andhra Pradesh have been assured funds by August, says P V Ramesh, state’s principal secretary in the health department. Too much emphasis has been laid on screening, says Sujeet Jha, head of endocrinology department at Max Hospital, Delhi. “If patients are screened, they must be treated right away,” he argues. The disease has quietly crept into the developing world. India and China together are expected to lose an income of US$ 900 billion between 2005 and 2015 due to diabetes, says WHO. The disease now threatens the younger generation as well. The cost of treatment is exacerbated by complications like blin-dness, kidney failure and foot ulcers. Stirred by the gravity of the disease, Goa, overlooked in the project, launched a diabetes registry in June. It will provide free screening at all its government and private hospitals. Patients will be given identity cards that will allow them free medical care, drugs and insulin. The silent killer has spread its fangs across the country, but the government seems to be faltering in making foolproof plans. The project is a positive step, but late by at least 20 years. Nice article. I love to read healthcare news and articles to update myself and know the interesting facts. Education on health issues are the intrinsic part of their effective treatment. There are many blogs and articles posted in on-line where we can get sufficient knowledge on health care. So to avoid health problem and control the complication please update yourselves.